Decay festers all around at the Salton Sea, the vast inland lake in Southern California that once hosted beauty pageants and boat races in its tourist heyday. Pollution, drought, and blistering heat conspired to end the fun, killing off fish en masse and leaving communities abandoned along the shore. But new life is moving into the breach. 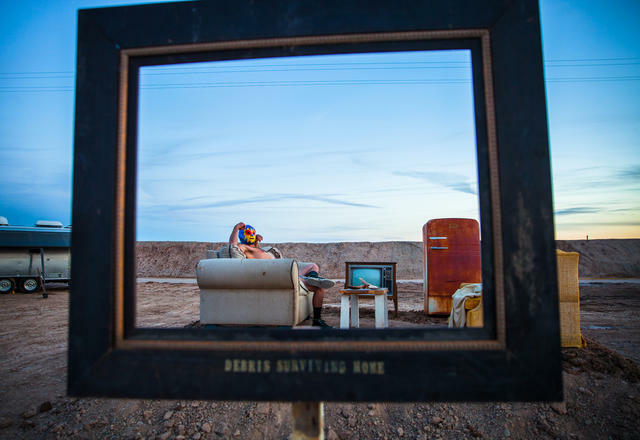 At Bombay Beach, artists drawn by the cheap prices and surreal setting have been snapping up lots and crumbling buildings as gallery spaces. 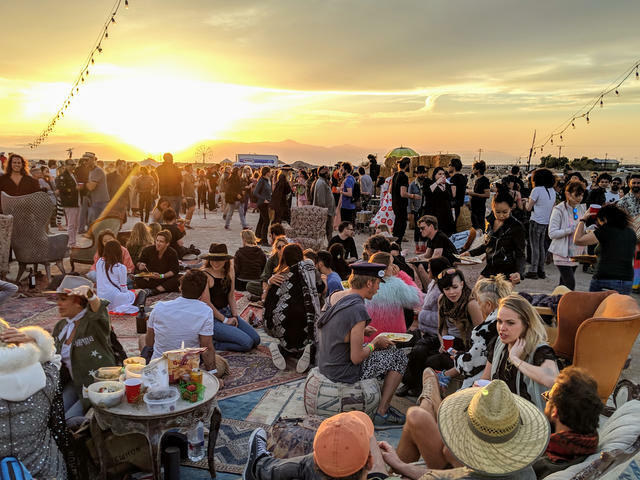 The signature event of the year is the Bombay Beach Biennale (it actually happens yearly), a free three-day festival of art, music, and ideas that was held last weekend. 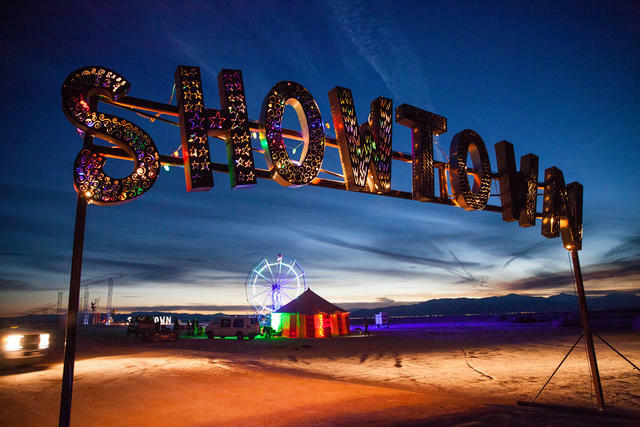 It included DJ dance parties, a post-apocalyptic drive-in, lectures on postmodernism, and dozens of art installations and performances. 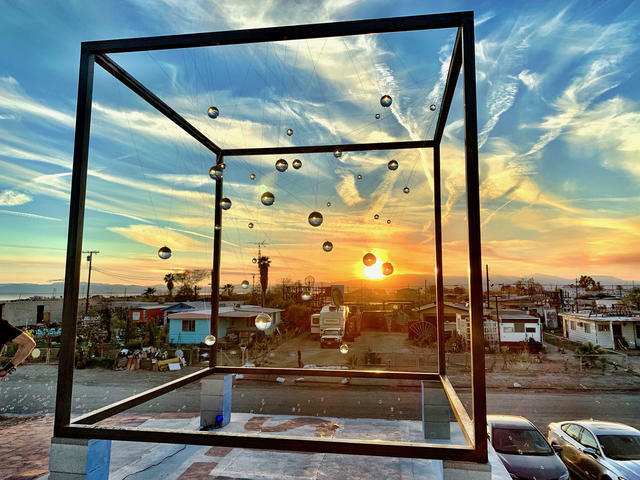 The vision for the event, which was started a few years ago by creative types from Los Angeles, is to establish a lasting outpost for art in the square-mile town of roughly 150 full-time residents. Many of the large-scale works remain on display year-round. "It's really more of a block party," said Lauren Brand, a festival organizer. 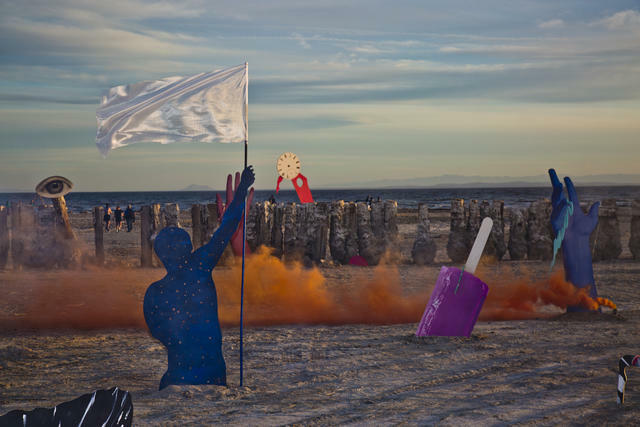 "It's meant to be a celebration of and for the residents of Bombay Beach." 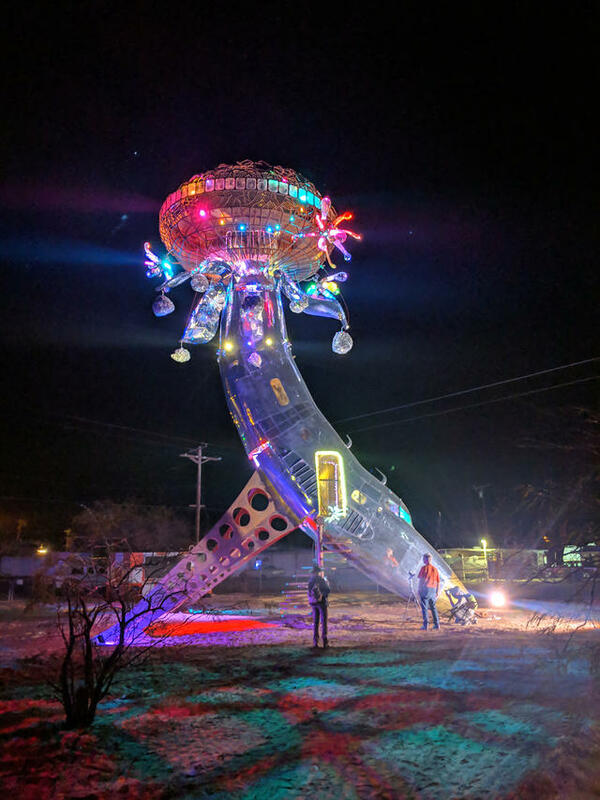 The festival's creators have been wary of allowing it to grow into a Burning Man-like colossus. That's one reason why, leading up to the event, the dates are kept secret. Those who score tickets agree to a strict policy: No spectators allowed; everyone participates. 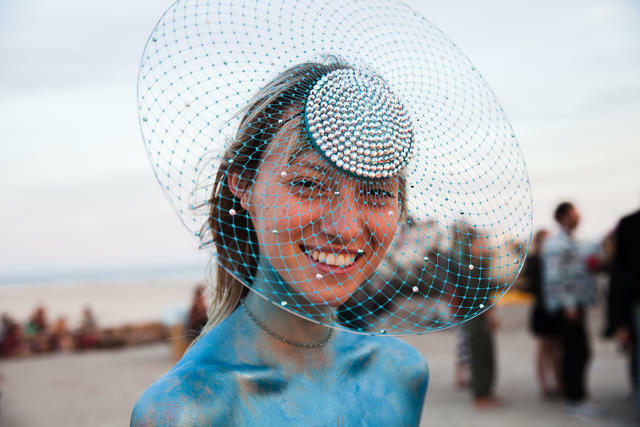 The festival shared a bunch of photos captured during the festivities last weekend. Here's a selection. Axon Orchestra led a parade. 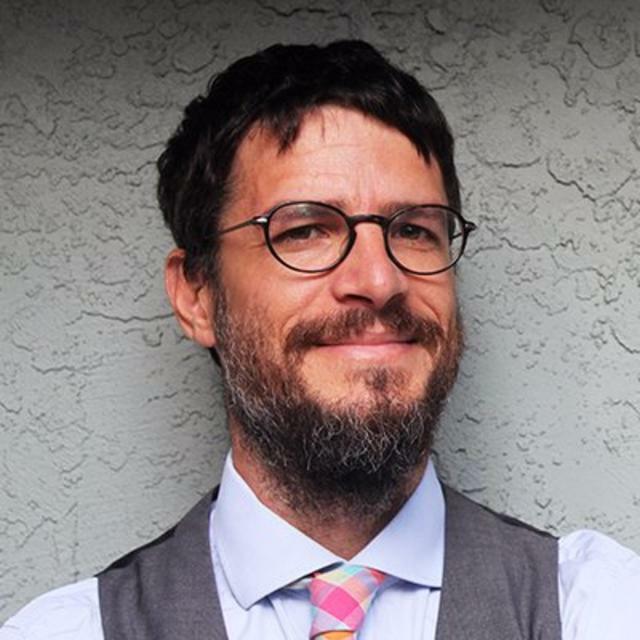 "Drive-In" by Stefan Ashkenazy, Sean Dale Taylor, and Arwen Byrd. The Toledo Show put on a performance. 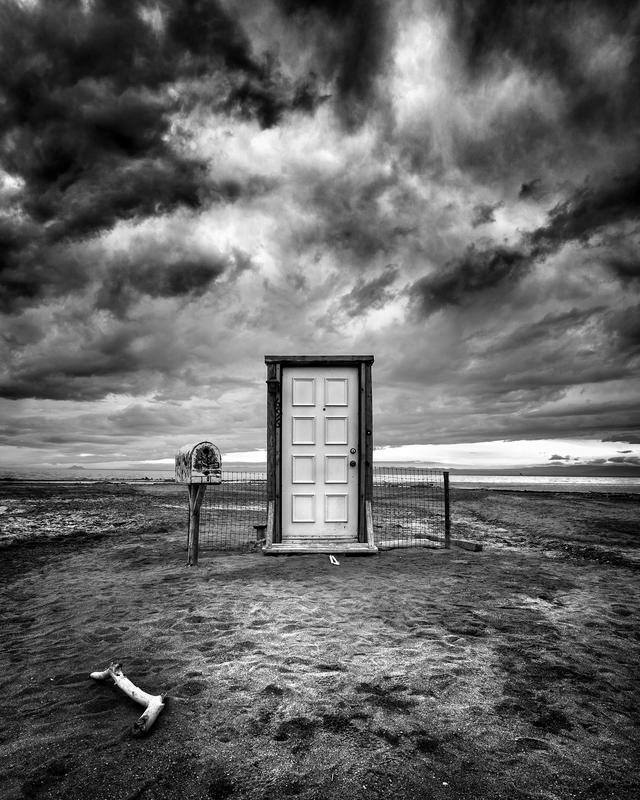 "The Open House" by Keith Jones and Lee Henderson. 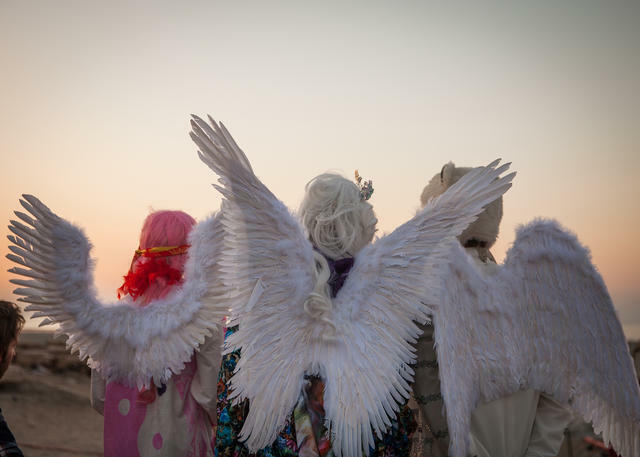 The festival has a rule: Everyone must participate. Several hundred people showed up for the festival. "Levitation" by Josephine Wister Faure. 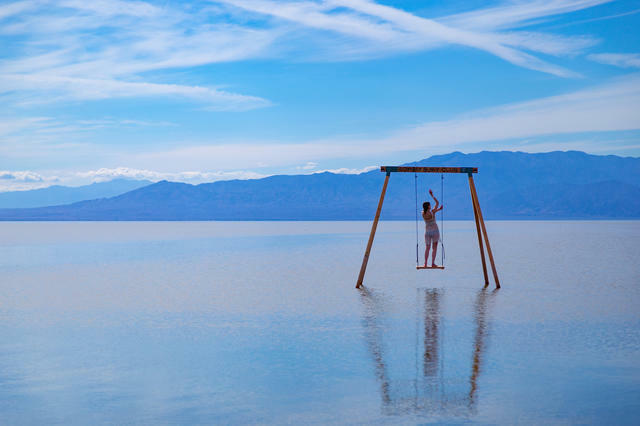 A billboard recalled the Salton Sea's days as a tourist mecca. 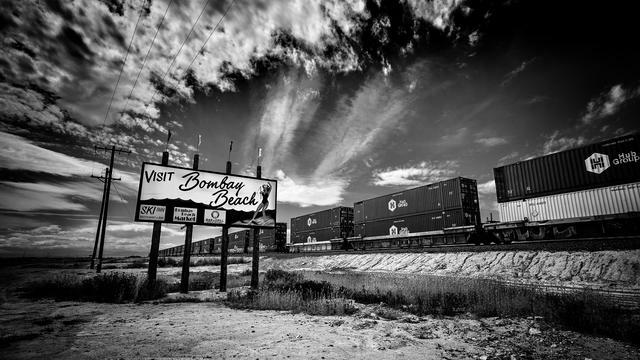 The tiny Bombay Beach community was mostly abandoned. But artists have been moving in. "Swingers & Sliders playground" by Olivia Steele. 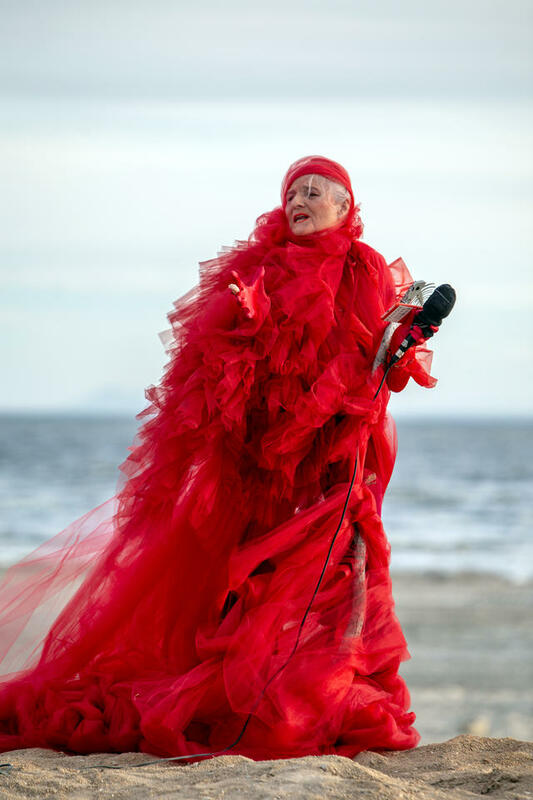 Vera Sola performed on the beach. "Bombay Boom!" 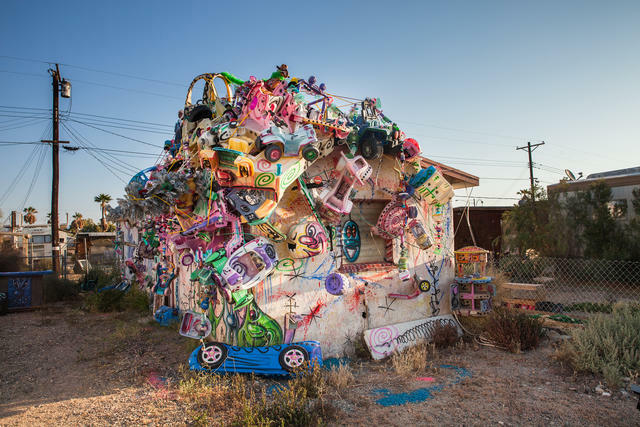 by Kenny Scharf. "Atlantis Inn" by Marco Walker and Tomek Sadurski. 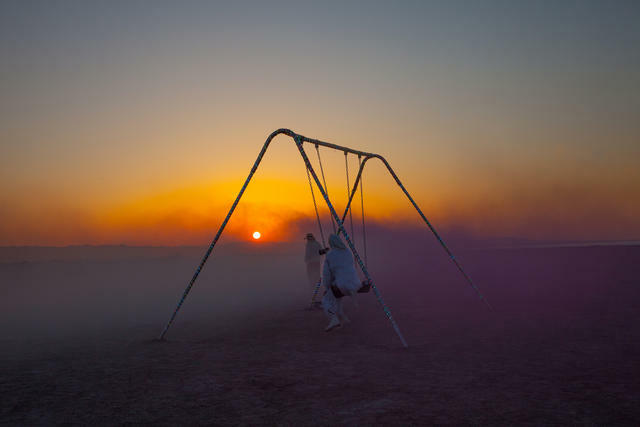 Artists have been drawn to the ethereal colors of the desert. "da Vinci fish" by Sean Guerrero, Royce Carlson, Nita Carlson, John Murphy, Jay Cobe, and Greg Hillg. Drinks were served from the Bombay Beach Beach Club. 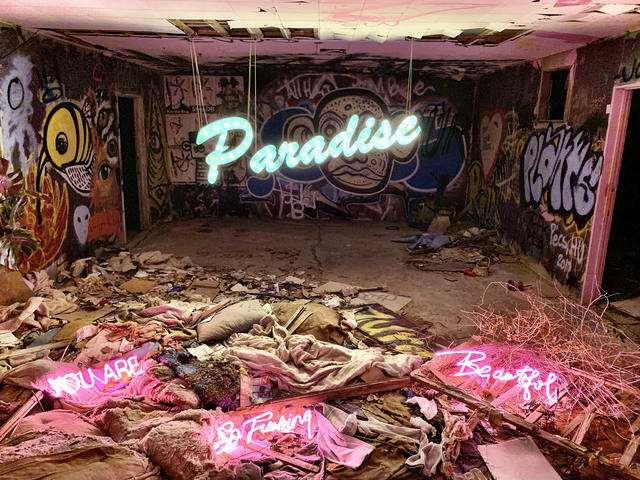 "Paradise, Abandoned" by Olivia Steele. Colorful performers on the beach. 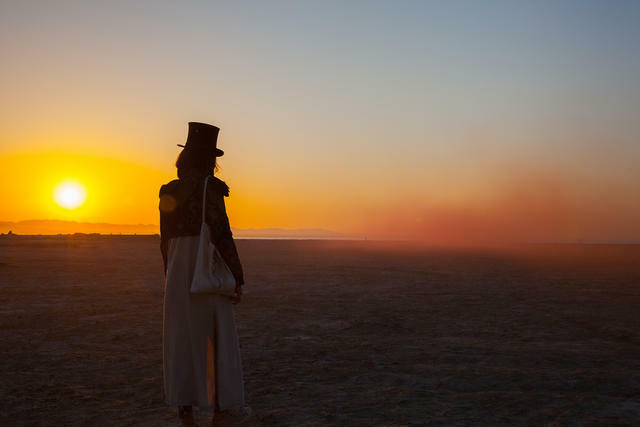 Golden hour on the Salton Sea. Pier pilings offered a stage. 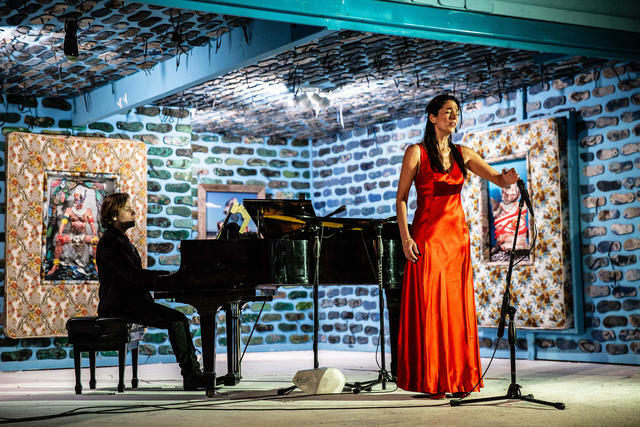 A performance at the Bombay Beach Opera House, designed by artist James Ostrer. 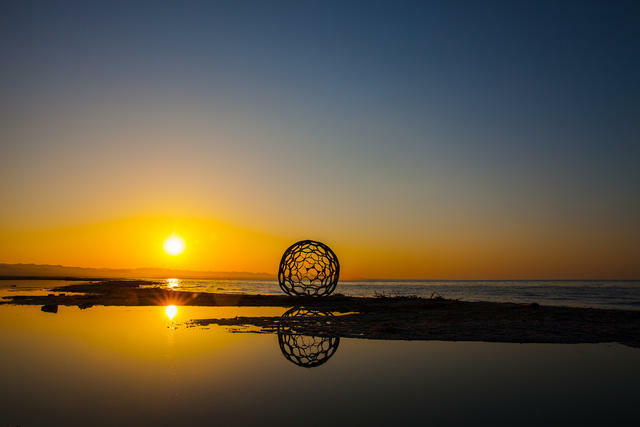 "The Water Molicube" by Scott Fitzel. 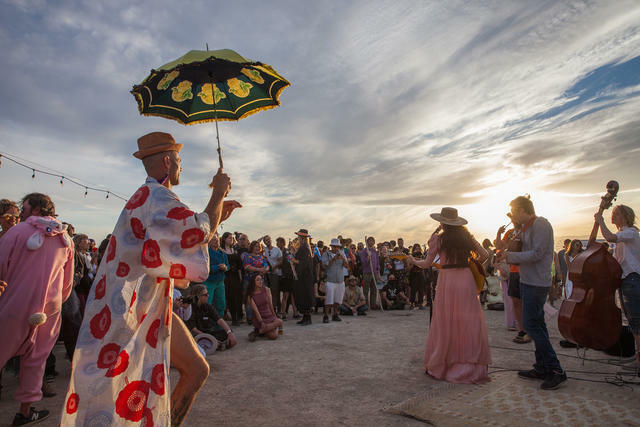 The festival has been a welcome distraction for permanent residents of Bombay Beach. 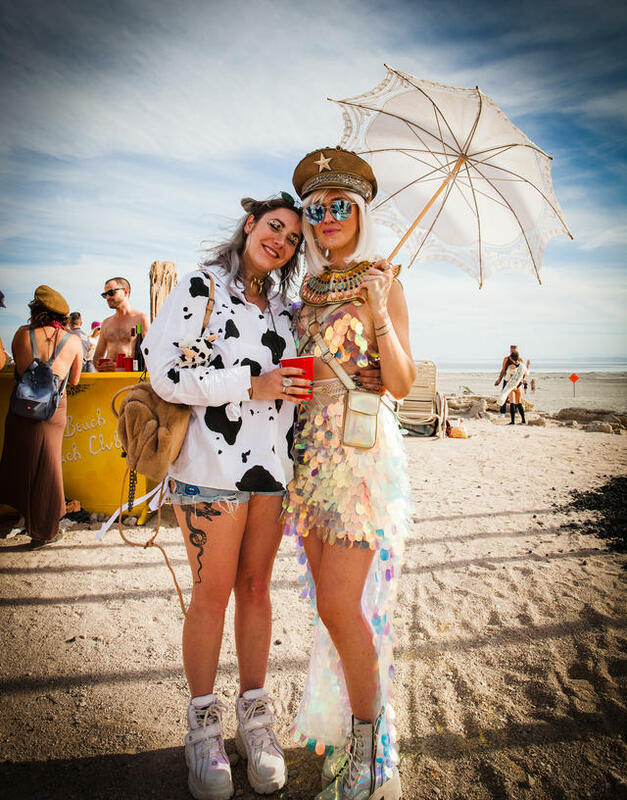 Fashions were flamboyant at the Bombay Beach Beach Club.